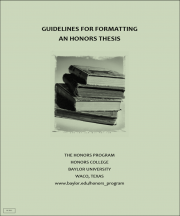 Students who are currently writing and completing Honors thesis projects should familiarize themselves with the extensive guidelines linked below. Questions about them, or about formatting issues not discussed by these guidelines (or by other resources discussed in them), may be addressed to Dr. Al Beck, Admissions and Advising Coordinator of the Honors Program. Once you have finished writing, defending, and editing your thesis, you will need to prepare a final paper copy for the Honors Program office. This copy will be bound and kept in the thesis library located in the Honors Suite, Morrison 203. In addition, a digital copy (archival PDF) will also be submitted online to BEARdocs and thus made available on the internet. There are particular guidelines that must be followed as you prepare your final copy. Many of these are listed in the “Guidelines for Formatting an Honors Thesis” located on the Honors Program website. Careful attention to formatting standards will ensure quality binding of the finished product. The Honors Program office requires both a paper and a digital copy of your thesis. Students may also purchase additional, professionally bound copies for a small fee. So, as an example, if you want 2 personal copies, please bring in 3 total printed sets, boxed if possible with a colored sheet in between each copy. Students can purchase a maximum of 4 personal copies of the thesis. The digital copy must be submitted online in a single PDF file. Digital copies are not to be sent via email or turned in on a flash drive. Please note: The program strongly recommends, but does not require, that each Honors student print and purchase an additional bound copy to be given to her or his thesis director. The shelf copy kept by the Honors Program office must be printed on white, 8.5 x 11 paper. Baylor’s Central Duplicating (Morrison 121, x1914) may be able to print your copies for less cost than some commercial print shops. Once the copies have been submitted to the Honors Program office, they are sent to the binders for final production. It takes approximately three months for them to come back to the office, at which time personal copies will be available for pickup or for shipment to your address. If you intend to pick up personal copies from the office, you will be notified via email when they are ready. The Honors Program pays the binding cost for the shelf copy. The binding fee for personal copies is $25 each. Four is the maximum number of copies that a student can purchase. This charge coves the binding cost and shipping charges to a single address. We are unable to split shipments to multiple addresses, and there is no discount for students who elect to pick up their copies from the Honors Program office. The Honors Program accepts cash or check for payment. Checks should be made out to "Baylor University." Please contact the program office at 254.710.1119 if you have any further questions.